“The new normal” is a term we hear all too often these days. It refers to a shifting baseline in some phenomenon. Unfortunately, it also implies a shift towards what is usually a less desirable or congenial condition. The unspoken implication of “the new normal” is that “you’d better get used to it” whether you like it or not. 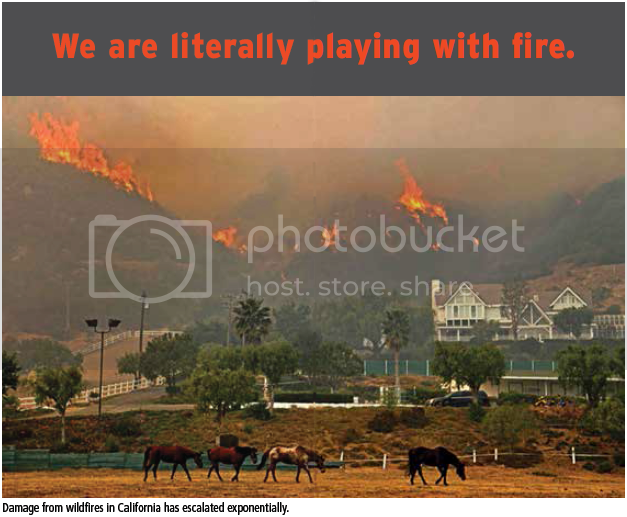 Such is the situation with wildfires in California and throughout the West. The new normal is hotter, drier temperatures and larger, more intensive and catastrophic wildfires: so-called megafires. Californians have had to deal with wildfires ever since newcomers began arriving in droves a century ago and building homes in fire-prone habitats such as coastal sage scrub and chaparral, which cover much of the state. Fires are an integral part of the ecology of these vegetation communities, and they will burn every few years despite our best—and often misguided—intentions. While crown fires (those that consume the crowns and foliage of large trees, killing them) occur much less frequently in the coniferous forests that cloak much of Northern California and mountain ranges in the central and southern parts of the state (Sierra Nevada; San Gabriel, San Bernardino, San Jacinto and Santa Ana ranges; Santa Monica Mountains; Tehachapi, Transverse and Peninsular ranges, etc. 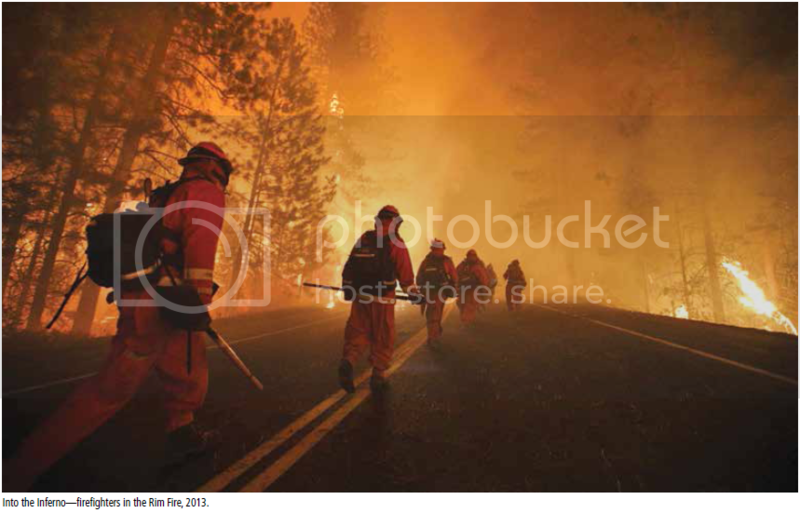 ), in part because of fire suppression efforts, when these forest fires do occur, they tend to be much larger, hotter and more destructive, both of the forest itself and of any manmade structures in their path. A forest erupting into flames is a terrifying and unforgettable sight. As temperatures climb from climate change and the Southwest goes from dry to still drier, turbocharged wildfires throughout the region will consume tens of millions of acres of desiccated brush and forestland. Fire managers refer to that vast volume of dry woody material—tinder—as “fuel” for wildland fires. And the changing climate and fire regime will convert many of California’s magnificent coniferous forests into patchy scrub; many sites will no longer be able to support trees or a forest canopy due to insufficient moisture. Bigger, unwieldy burns—megafires—are becoming the new normal, according to a new report, which points to several reasons: States such as California are getting parched more frequently by drought; housing developments are pushing more deeply into forests; and the U.S. Forest Service is generally suppressing fires rather than letting them burn naturally, which would reduce the brush that fuels future fires. We continue building [in fire-prone areas]. We make fire management so much more difficult. The first thing you’re going to do is run and protect people’s homes. 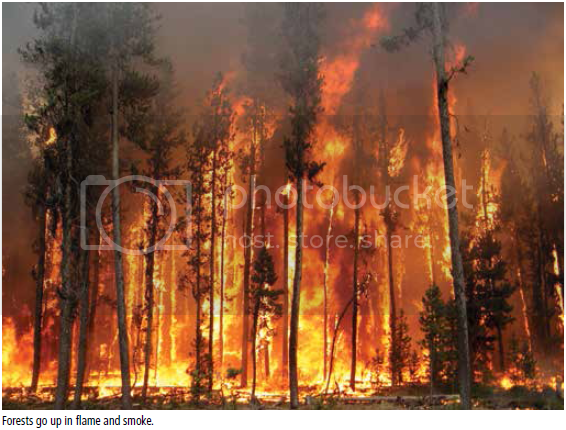 Two decades ago, the average national cost of fighting forest fires each season was $350 million. Now it’s increased nearly six-fold to $2 billion because of the extreme cost of fighting wildfires on the wildland-urban interface. The suburbs and exurbs sprawling and penetrating ever more deeply into shrinking wildlands expose ever more people and property to wildfire. And it is explosive population growth in California and the other western states that drives most of this sprawl. On Earth Day 2014, NumbersUSA released a nationwide study on the causes of sprawl— Vanishing Open Spaces: Population Growth and Sprawl in America. I was one of the authors of that study, which was was based on an analysis of long-term data on the growth of urbanized and developed areas collected by two federal agencies: the U.S. Census Bureau and the U.S. Department of Agriculture’s Natural Resources Conservation Service. Vanishing Open Spaces revealed that in California alone, sprawl devoured 419,840 acres (656 square miles) of natural habitat and farmland between 2002 and 2010. Population growth accounted for more than 90 percent of this sprawl. Over the past three decades (1982-2010), approximately 2,126,720 acres (3,323 square miles) of California open space were lost to development. Population growth was responsible for 97 percent of this loss, while decreasing density—the exclusive focus of almost all antisprawl activists—accounted for just three percent. Now a warming climate is exacerbating an already atrocious situation. In winter, less snow and rain are falling, and the landscape is drying out. The wildfire season used to start in June; now it starts in May. 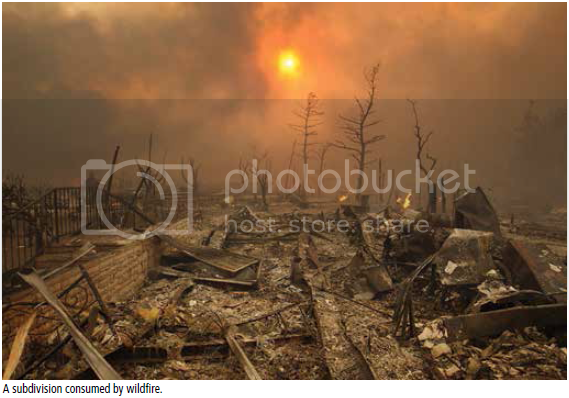 Over the last decade, 10 states, mostly in the West, experienced record wildfires. The acreage burned annually by wildfires in recent years is double the historic average. 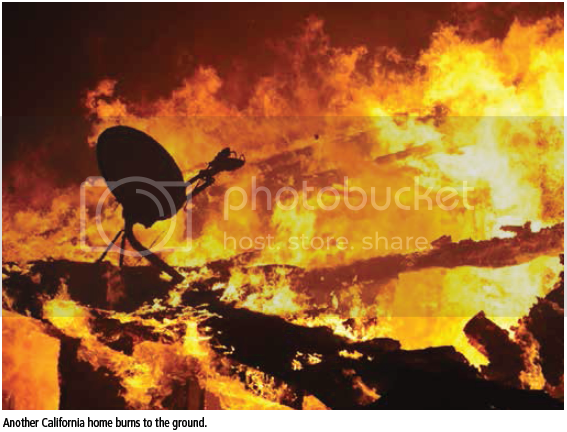 California suffered through the Rush Fire in 2012 and the Rim Fire in 2013, the second—and third—largest fires in its history. California’s driest year on record was 2013, but that’s being surpassed by 2014. By early September 2014, officials had cautioned that California’s forest lands were critically dry as the state prepared to enter the two months—September and October—that historically bring the largest and most damaging wildfires. 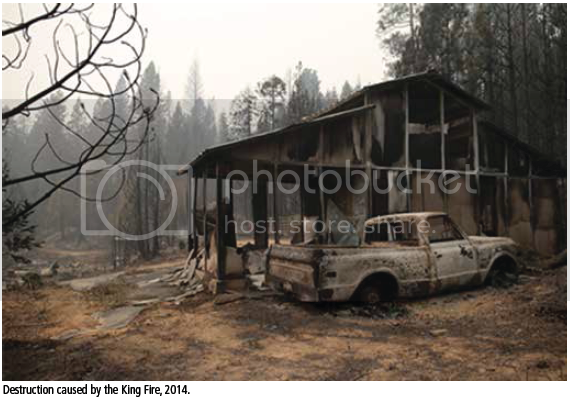 Already this year has seen the Bridge Fire in Mariposa County, the Happy Camp Complex Fire in Siskiyou County, and thousands of smaller fires. And federal funds for fighting wildfires have been running low. Firefighters with the California Department of Forestry and Fire Protection had combatted more than 4,000 fires by September, 500 fires more than for the comparable prior year period. Can anything be done over the long term to prevent this wholesale descent into a tinderbox modern version of Dante’s Inferno? Certainly, and at the local, national and global scales, though Californians, Americans and global citizens have all been disinclined to undertake the needed measures. Population stabilization is but one of them, but an indispensable one. We can escape individual wildfires, but not the overarching consequences of our actions.